What is scrapple? Underappreciated breakfast meat? Gross pig offal? On this scrapple blog we will answer these questions and more! 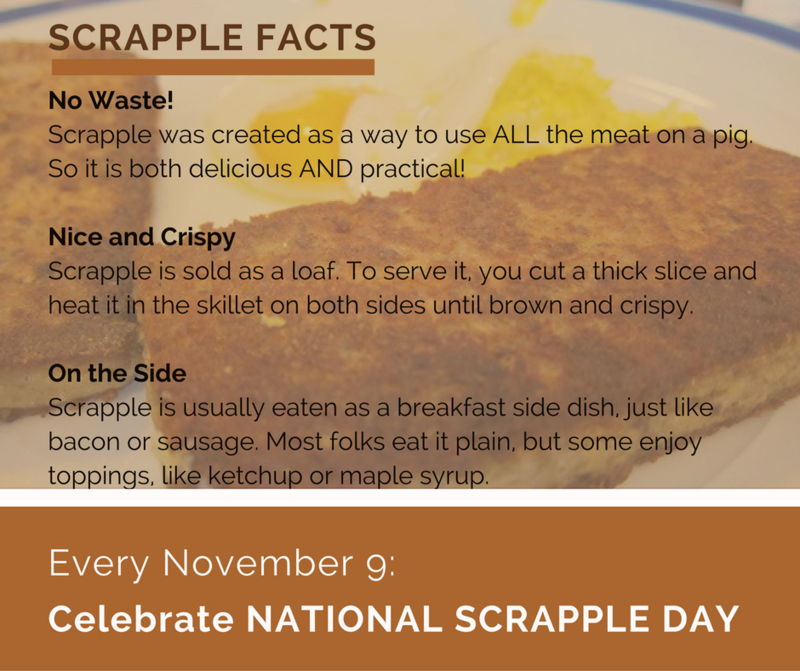 November 9th is National Scrapple Day! Today, November 9, is National Scrapple Day (though I'm sure you already knew that and were celebrating by heating up your scrapple breakfast, lunch, and/or dinner). It was the second full weekend in October. Looking around me, I saw people waiting in long lines for scrapple sandwiches at three separate vendors. That is when I knew I was in the right place. I was with my people again. I was attending the Apple Scrapple Festival. I ran across this fabulous book recently. 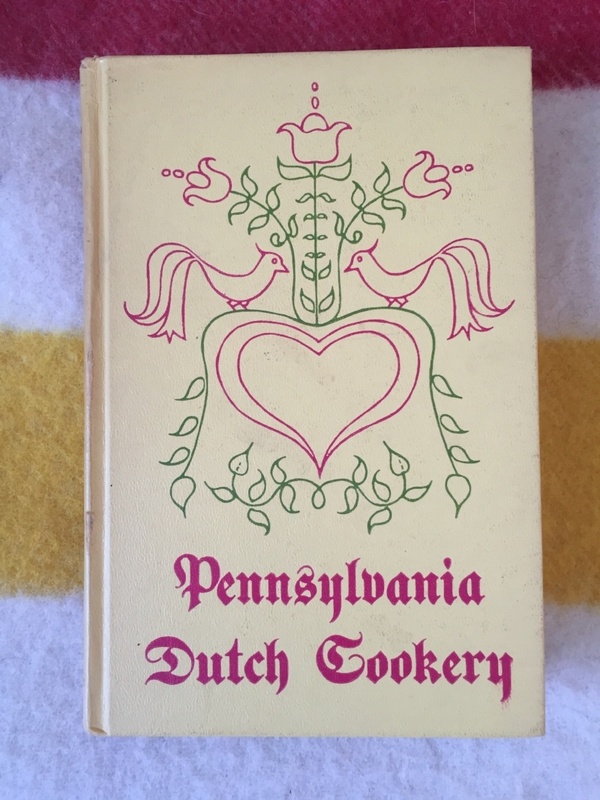 Pennsylvania Dutch Cookery written in 1935. The Scraffle: A Scrapple Waffle Like You've Never Seen Before. BEHOLD! 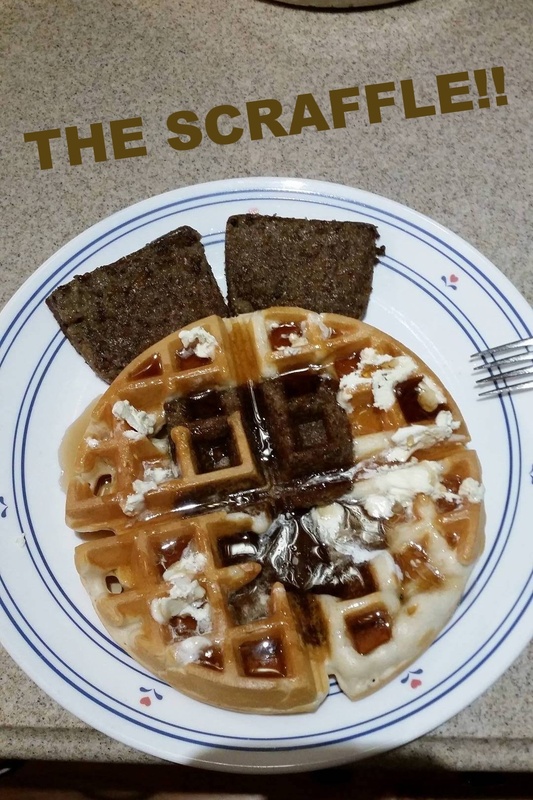 A brand new scrapple + waffles invention! It's creator, Israel Engle, calls it The Scraffle!! What the Heck Do People Put on Scrapple? You're at your kitchen table and scrapple is sitting there on your plate next to your eggs and pancakes. Or you're at the diner and there's a beautiful side dish of crispy scrapple slices sitting there. Before you dig in to the scrapple, what do you put on top of it? 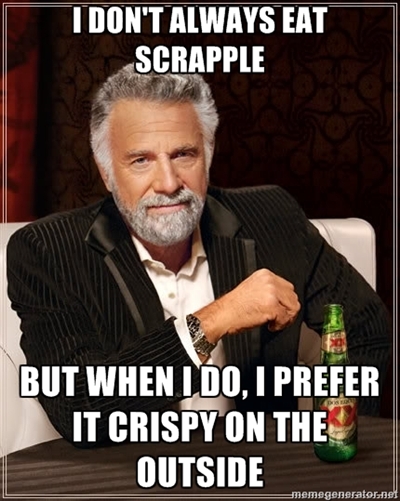 Every scrapple lover has their own answer to this question. Are there any odder scrapple toppings out there we can all learn from? I put the question out there to the Scrapple Facebook Page and was not disappointed. I counted up the answers and below are the not-at-all-scientific results. I was poking around the internet, looking for some animated scrapple GIFs and I didn't find any. 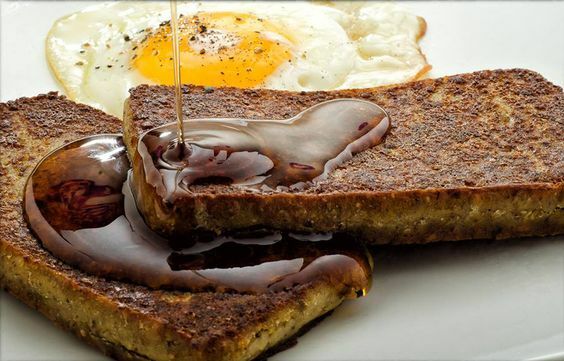 What is it about scrapple that we love so much? I know, it is delicious. But why? OK, also true. I think we're getting closer. Why does it taste so good? Because it's pork, and greasy, and crispy on the outside but warm and gooey on the inside. 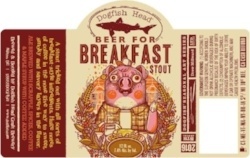 If bacon is good enough for ice cream, why not scrapple? But, alas. The good folks at Billy Penn did some research and found out it was all too good to be true. 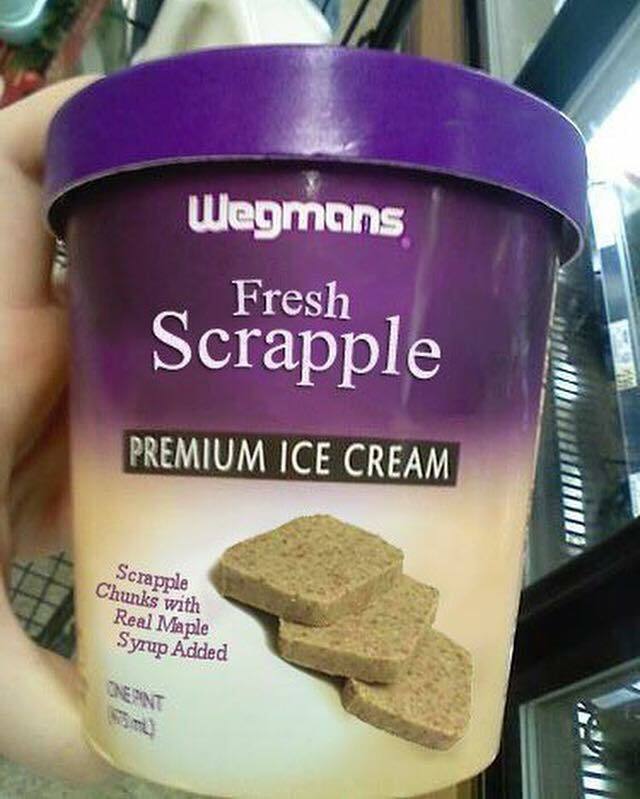 In fact, that photo of Wegmans Scrapple Ice Cream ("scrapple chunks!" #nomnomnom) has been quietly living on the internet since 2010 when it was created by Pete Ruggieri and posted on his Facebook page Scrapple is the New Bacon. A recent reshare shoved it into the scrapple spotlight, leading to thousands of reshares (seriously) and a rollercoaster of emotions. I thought the journey would end there and we would all be left wondering, would scrapple ice cream be any good? Would it be made with real chunks? Can you somehow maintain the crispy outside while still enveloping it in ice cream? But Danya Henninger, Cassie Owen and Angie Nassar at Billy Penn wouldn't let the dream die. They wondered aloud too, and then did something about it. And suddenly scrapple ice cream existed! When you describe scrapple to a vegetarian they almost always cringe. Not only is scrapple made of meat, but it contains hearts and livers and, well, pretty much a little bit of every part of the pig. OK, you're probably never going to get a vegetarian to try even a tiny bit of scrapple (unless it's vegan scrapple...). But you might be able to get them to appreciate it.